I mentioned in my post this week for my (in)famous Maple-Roasted Turkey with Sage and Bacon Cornbread that I was working as a Brand Ambassador for The Federation of Quebec Maple Syrup Producers. That contact originally came about when I was contacted by a PR firm wanting to know if I wanted to feature maple syrup in a cocktail; I’m wondering now how that got away from me? I happened on the recipe this week and with just a couple of slight revisions managed to get it done this morning, in time to enjoy one this weekend. 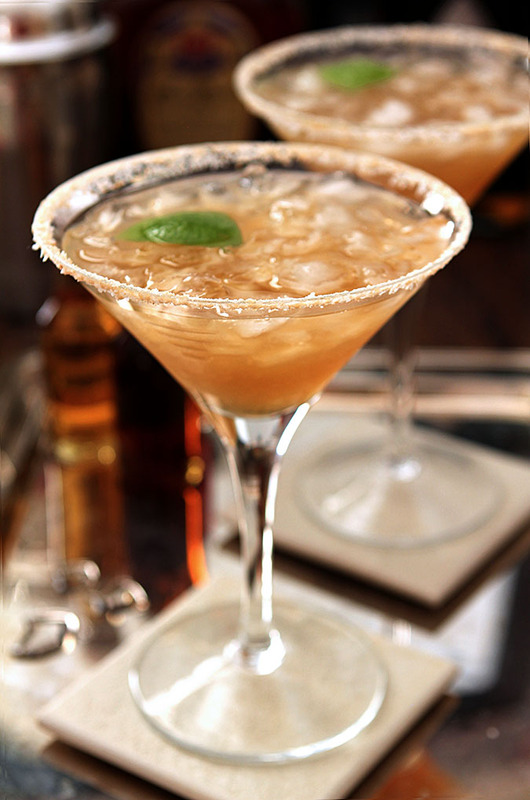 The idea of a Maple Margarita may be quite the stretch from my typical margarita efforts which include a variety of fruits alongside a pretty standard base of tequila, orange liqueur and lime juice which is one of the many reasons I was intrigued. That is also contains whiskey did nothing but up that intrigue and I was pleased to have some Crown Royal Canadian Whiskey on hand…seems prophetic doesn’t it? Who would have ever considered mixing quintessential ingredients from our neighbors both to the north and the south of the US into one cohesive cocktail? But I’ll tell you it works and my tasting partners (neighbors) and I loved it. This is not for the first time margarita drinker or the faint of heart, it is most definitely a bold version with the orange liqueur nowhere to be seen as the Canadian Whiskey fills in. The original recipe calls for all of the ice to be mixed with the ingredients to form a frozen version of this margarita…frozen cocktails aren’t my gig so I opted to serve it over crushed ice and it was perfect. 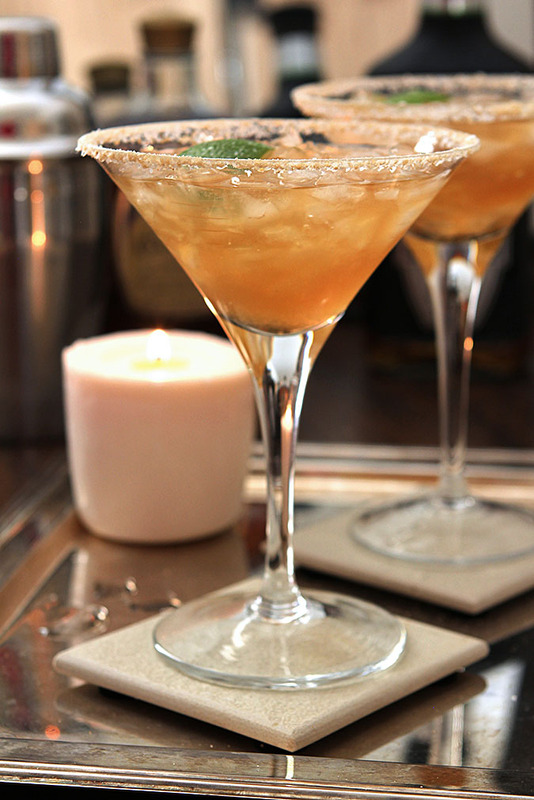 Rim a margarita glass with a lime wedge and then dip the edge in the salt and maple sugar mixture. Fill the glass with ice and set aside. Put the remaining ingredients into a cocktail shaker and shake vigorously until the container is ice cold. I see that this is an older post, but wanted to let you know that it’s become a Thanksgiving tradition! I love that Kim, thanks so much for letting me know, I love it too! This is beautiful! I love that it sounds so unique and different from your average margarita. Definitely going to give this a go! What tequila do you recommend for this cocktail? I made your Black Goblin with the Hornitos Black Barrel tequila. On the rim, I used raw sugar instead and it was divine. I’m planning on making these for the Thanksgiving weekend when we drive back to Colorado! Last night I “shook” up the Cranberry Sage Cocktail. Who knew White Cranberry Juices is so hard to find? What a great cocktail and such a great color! I used the Hornitos Black Barrel; one stage is aged in bourbon barrels so seemed a good fit. You can’t go wrong with maple! This looks perfect for a Thanksgiving celebration. I love maple! Good thing, too — I’ve got it all over me at the moment! Just finished some pictures that included a maple pour shot, and I made a bit of a mess. 🙂 Anyway, really creative idea. Love the bit of whiskey you’ve added to this. Thanks!